A disorganized, cluttered dental office often leads to wasted time, missing materials, and increased stress. Zirc’s products are designed with efficiency in mind, so you can easily and affordably organize your materials and instruments for chairside use, sterilization, and storage. When it’s time to get organized, Zirc is with you every step of the way. Explore our resources below to learn more about our innovative products and organizational strategies, read articles and product reviews, watch our informative tutorial videos, and more! Download the Rep Checklist here and get your practices' organized today! To learn more about our products and how to use them, visit our YouTube channel or view Zirc's full line of videos and tutorials here! Isolation is critical to most procedures and can be accomplished in many different ways. Zirc's Organizational Box of Efficiency is designed to improve your workflow. There are many options in isolation. Why Mr. Thirsty One-Step from Zirc? Maximize efficiency while maintaining sterility during instrument processing and organization. Dentistry requires skill and precision with your hands but more importantly your vision. Over a person's lifetime, their vision will slowly become less acute and will need to rely more on magnification along with high-quality imagery. Designed for use during dental procedures, the Mirror Magic® Anti-Fog System prevents dental mirrors from fogging and provides hygienists with a quick method for removing debris during procedures. Its unique system includes a disposable, self-adhesive swipe pad and anti-fog solution. "One of the biggest challenges facing every clinical dental hygienist is how to efficiently and effectively keep the mirror surface clean and fog-free." A time and motion study was performed to evaluate the length of procedure time when mr. thirsty® one-step was used in comparison to when it was not used. Four doctors participated in this evaluation and a total of 40 procedures were evaluated. Dentistry requires skill and precision with your hands but more importantly your vision. The brightness and clarity in Zirc's Crystal HD® lens provides a clear view so you can work more efficiently while saving your eyes from the strain and fatigue caused by a regular rhodium lens. When is the last time you dove into the depths of your operatory drawers or scanned the storage of your sterilization area cabinets? We use organization every day, week, month and year without even thinking about it. To Organize or To Organize…That is the Question. But there are no Shakespearean doubts here. There is no choice. Where did we put it?” If you’ve heard these words in your office—or have uttered them yourself—you know that disorganization can translate into wasted time, missing materials, and increased stress. And if you keep promising to get organized tomorrow, you might be realizing that tomorrow never seems to come. Zirc's Organizational Box of Efficiency (Z.O.B.E.) is your answer! Zirc’s Crystal HD mirror combines outstanding brightness and color accuracy with scratch-resistance and a lightweight, comfortable design. Zirc’s new Crystal HD mouth mirror is 40% brighter than rhodium and has a 99% reflection factor, providing “previously unavailable brilliance and color.” The autoclavable mirror, with plastic head and scratch-resistant lens, and the handle are Microban-protected. The open top, round holes, and radiused corners on E-Z Jett Cassettes allow for better water flow. The E-Z Jett Cassette from Zirc comes with a variety of features to aid efficiency. Some of these features include better cleaning because of the open top, round holes, and radiused corners; an attachable cover that opens and folds back easily; and improved infection control with the inclusion of Microban Antimicrobial Protection. To keep syringe tips with other instruments during sterilization, a syringe tip clip is included on the holder. The autoclavable cassette is available in 16 colors. The Composite Whizard Organizers are designed to be portable and convenient. Zirc manufactures 2 composite organizers—1 for syringe composites and 1 for capsule composites. Both organizers come with the accessories needed to organize the composite material, along with storage space for other items needed during the procedure. At Zirc, our top priority is to save you time. We provide innovative products and organizational strategies to streamline your dental office operations and allow you to increase efficiency. Learn more about our color-coding system and products. Give our products a try at no cost with our exclusive Z.O.B.E. 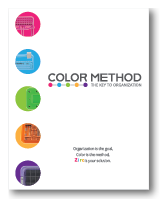 – Zirc’s Organization Box of Efficiency – with more than 25 of our color-coding products. Our efficiency experts are on hand to answer your questions about our products or setup at any step along the way. This brief E-Book will show you simple steps you can take to improve your practice organization, reduce stress, and ferret out all of those little efficiency killers.